Building security managers have day to day responsibility for a team of staff employed to ensure the safety and security of staff, public and physical assets of a building. Managers could work for corporate businesses, particular sensitive buildings such as government offices, museums, archives, galleries or other types of property where high security is required. 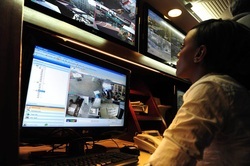 The role involves managing a team of security staff, CCTV staff and may require the postholder to manage the security budget, ensuring equipment is kept up to date, managing team rotas, dealing with incidents, identifying training needs and maintaining security policies and ensuring procedures are adhered to. You would need good managements skills, the ability to delegate, have high levels of integrity. You may need to conduct vetting of new staff, able to deliver training and high level of responsibility for the work. The work may require you to act as incident manager and liaise with police or other services as necessary and be on call 24-7 if required. People with these skills and experience of working in the industry and recognised professional qualifications are most likely to on obtain this kind of role. Facility Manager or Events Manager.